Based on a short story by Haruki Murakami, Tony Takitani is an offbeat and economical little story of urban isolation. Issey Ogata plays the titular character, a solitary young illustrator whose lonely city-dwelling existence takes an unexpected detour the moment he meets Eiko (Rie). Eiko’s main passion in life is clothes – when she sees something beautiful she needs to own it. But it’s more than a passion, it’s an addiction, and when Tony suggests that Eiko curb her reckless spending events take a tragic turn. Like much of Murakami’s work, Tony Takitani is primarily a study in contemporary alienation (loneliness, the film suggests, is in Tony’s genes as we watch him follow in the same sad footsteps of his father), although it’s less outlandish and playful than some of the author’s novels. But for a film which has such a downbeat subject matter at its heart, there is something oddly serene about Tony Takitani. This is perhaps mainly down to it’s central character’s inability to feel any extremities of emotion, and the film reflects Tony’s outlook on life through its measured pacing and spartan application of dialogue. Most of the words in the film come via Nishijima Hidetoshi’s softly spoken narration which again adds to the picture’s overwhelming sense of serenity. Not a lot really happens in this sad but unsentimental tale, and what does happen passes by in an almost dream-like fug. Visually the film presents a world stripped as bare as Tony’s emotions, and Ichikawa has spoken of how his intention was to create something akin to an Edward Hopper painting – composing shots out of blank spaces. And it’s true that every shot here does seem to have been set up like a minimalist work of art, something that you’d like to instantly frame and slap on your bedroom wall. 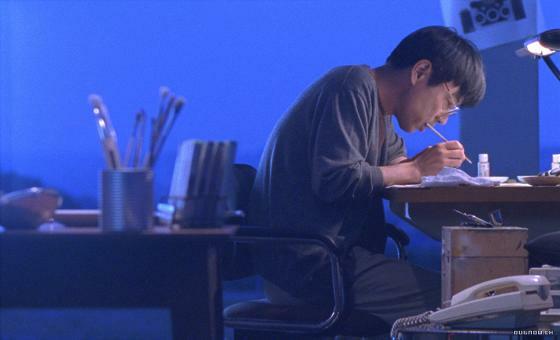 Special mention must also go to Ryuichi Sakamoto’s mournful piano score that helps to connect us to the distanced, troubled characters of the movie. It’s the kind of film where you stay dreamily listening to the music right to the close of the final credits, as if it somehow seems to summarise everything that you’ve just seen onscreen. The main DVD extra here is the Making Of feature which is longer than the actual movie and is possibly even stranger. It tells the story of the entire shoot of the movie – and the emphasis here is on story, as it’s pieced together with odd, philosophical narration, occasional speeded up footage and the permanent sound of a accordion wheezing in the background. If you’re a fan of Tony Takitani you’ll love it. The DVD also comes with trailer and a stills gallery.